Ever wondered about the carbon footprint of your garden decking? The Danish Technological Institute and the Swedish Environmental Institute has compared the CO2-release of different decking materials. Which material comes out on top? 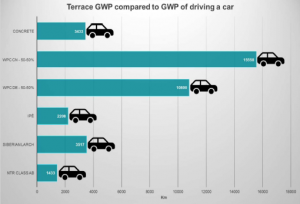 And what is the CO2-impact of your garden decking compared to your everyday activities such as driving a car? Results show that there is a large difference in the global warming potential of the different terrace options. The Chinese wood plastic composite terrace has by far the largest global warming potential (1867 kg CO2-eqvivalents). NTR Class AB treated pine wood has the lowest potential (172 kg CO2-eqvivalents) followed by the ipé terrace (265 kg CO2-equivalents). The global warming potential of the Chinese wood plastic composite terrace is more than 10 times higher than the NTR Class AB treated pine wood terrace.